Over the past century, it's been typical that people from other countries would generally move to the US or UK to find a better quality of life. The 'American Dream' is hardly a new concept. But, I believe that's all starting to change. Many British and American natives are now seeking a simpler and happier life elsewhere. So, is the reverse happening? 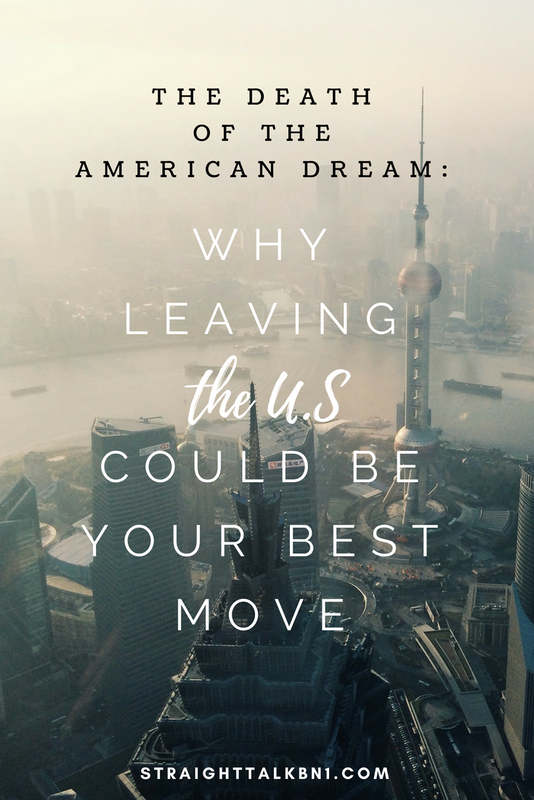 Can moving outside the US or UK provide you with a better standard of living? Every time I scroll Facebook, a new article pops up about why somebody left the US and is making a great life for themselves elsewhere. They always list the following factors; a better ratio of wage to living costs, the horrific fact that US students must get into debt of $50k+ to earn a degree, hugely expensive healthcare, no guns, and of course, the terrible food habits. If you're a regular Straight Talk reader, you'll know that I moved from my native England to Lithuania just over a year ago - and I can't get enough. Right now, I'm seeing a trend among people I know, and they are all starting to ditch England, too! Related: Is Big City Life to Blame for Bad Mental Health? I just got inspired to write this piece as a friend just messaged me saying she's decided to move to Gran Canaria - she's longing for outdoor activities like hiking, surfing, and cycling - and another perk is the cheaper rent! I mean, that sounds great, doesn't it? If you open yourself up to a whole word of different opportunities, your life can take incredible new directions! Where is Britain/U.S Going Wrong? Millennials are getting pretty disenchanted. We aren't like our predecessors, we're not satisfied with working in the same job for 50 years. We're not satisfied with low wages and high rents, and we're certainly not satisfied with the increasingly limited opportunities. More and more people have been flocking to big cities on false promises, and I believe that the good opportunities have run out. Listen to this: you're fresh from university and riddled with debt, yet you're expected to do a handful of unpaid 3-month internships to get your foot on the career ladder. So, how exactly are you supposed to pay your rent? With smiles? Or this: You've somehow scraped by and completed all those internships, and now you're ready to apply for an entry-level job. But wait - 1,000 other candidates are applying for the exact same job... You're basically a needle in a haystack at this point. Meanwhile, in England, the government simply tried changing the term minimum wage to 'living wage' without actually paying anyone any more money. What was their logic? If it sounds better it will be, right? Wrong. It's all a goddamn illusion. I'm not saying other countries don't have their problems - not one of them is perfect! But, if you're feeling STUCK, maybe it's time to go on an adventure? If you open yourself up to a whole world of different opportunities, your life can take incredible new directions! Stock your kitchen with the best #FoodPorn recipes! Featuring BOSH!, Avant-Garde Vegan + more. Who would want to be stuck at a desk, when it's possible to earn while you travel? Culture shock? Check. Language barrier? Check. Anxiety? Check. I’m sick of vegans being labelled as preachy, so let’s change the way we influence others. One vegan product can’t put right all of the problematic aspects of this company. Social Media Addiction: Is The Internet Killing Us? Can a 'like' on Instagram replace a compliment in real life? Growing up in the country of rain, I’d never seen anything more beautiful. Rent: £825. Council Tax: £100. iPhone: £50. Every single month.